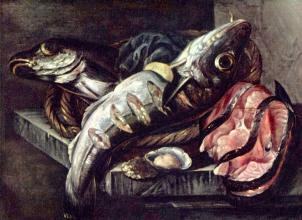 While in the 1640s most of his paintings were seascapes, Van Beijeren began to develop as a skilled still life painter of fish. 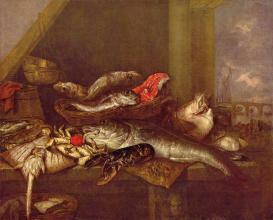 In the 1650s and 1660s he focused on still lifes with fine silverware, Chinese porcelain, glass and selections of fruit. 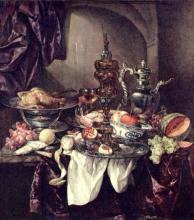 He also painted a number of floral still life paintings. The Academy of Fine Arts Vienna, the Ashmolean Museum (University of Oxford), Iris & B. Gerald Cantor Center for Visual Arts (Stanford University, California), the Cleveland Museum of Art, the Detroit Institute of Arts, the Honolulu Academy of Arts, the Los Angeles County Museum of Art, the Louvre, the Metropolitan Museum of Art, the Minneapolis Institute of Arts, the National Maritime Museum (Greenwich, UK), the Philadelphia Museum of Art, the Rijksmuseum Amsterdam, Royal Museums of Fine Arts of Belgium and the Seattle Art Museum are among the public collections holding paintings by Abraham van Beijeren.